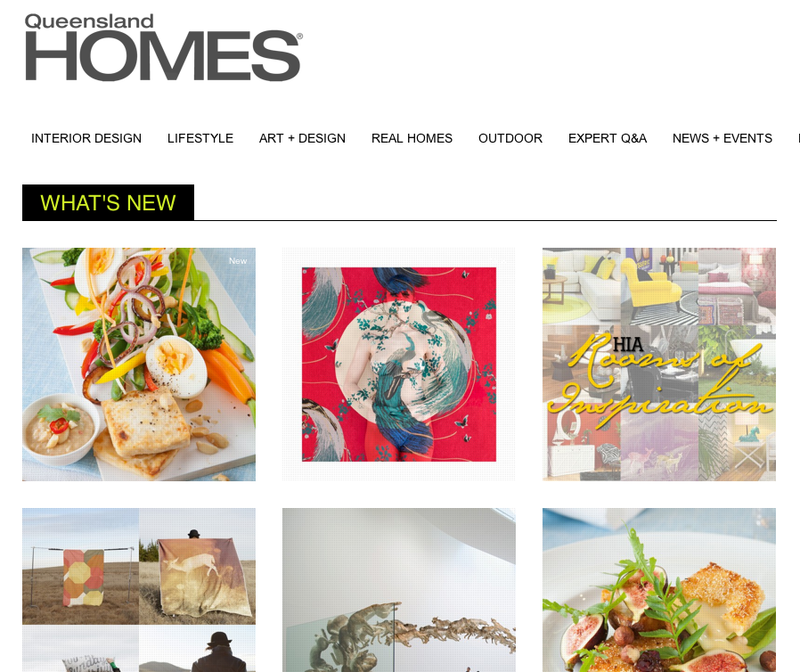 Queensland Brides: Married with children: How to include your brood in the ceremony, reception and even the honeymoon. Married with children: How to include your brood in the ceremony, reception and even the honeymoon. As well as a commitment between two people, a wedding can be quite a family occasion; especially if either or both of you have children. Marrying with children, whether from your current relationship or a previous marriage, is the blending of two families and certainly adds another dimension to the marriage and the wedding. 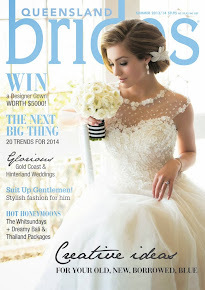 There are many meaningful ways for children to be included in your wedding. Keep in mind though, that kids can be unpredictable, you'll want to make sure they are playing an appropriate part for their age, and that you've done everything you can to make them comfortable with the extent of their role. Whatever you do, be sure to be patient. They may get suddenly shy, or uncomfortable with what's going on; make sure you let them do as much as they are happy doing. There are a lot of ways even reluctant children can be included in the lead up preparations and on the actual day. We have compiled some ideas for making your children feel part of the celebration. Involving your children in the decision making process for the wedding is a great way to start and will help make them feel like a special part of the planning. Preparation for the wedding helps get the kids excited, children can be involved in assisting with making wedding favours and table decorations, and helping choose their outfit and accessories. Including your children’s names on the invitations, getting them to help with putting the invitations in the envelopes and putting stamps on the envelopes are just some simple ways to make them feel they are an important part of the event. Explain to young children what they will see and hear at the wedding, (crowds, music and clapping), this may help avert fears and feelings of unease. If the children are to be part of the procession, practice walking down the aisle, until they are comfortable with it. Show them exactly where you will be, and who they should go to if they feel shy or upset. On the day a special wedding gift just for them is another way to make them feel it is a special day for them, as well as the two of you. Children can be involved in many roles at the ceremony, from welcoming guests as ushers, handing out order of service programs, escorting the bride down the aisle, as a flower girl, page boy, bridesmaid or best man. Older children could contribute by doing a reading or reciting a poem during the ceremony. 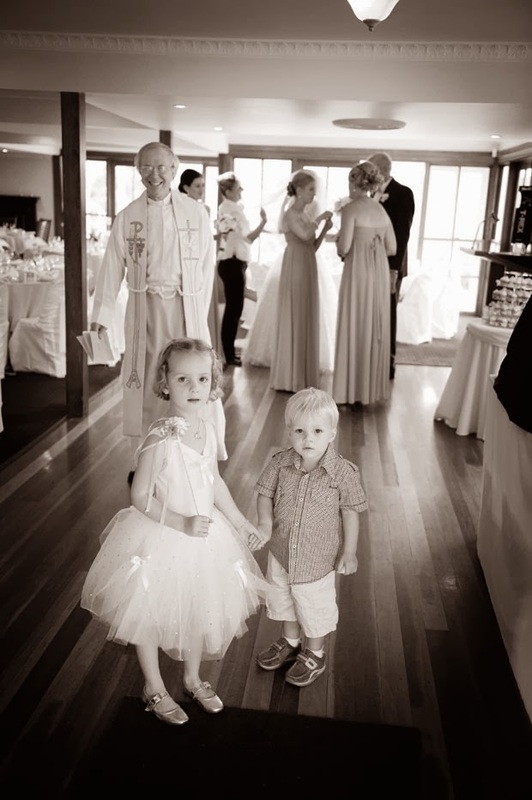 Assign your children a helper – ideally another member of the wedding party or a grandparent who can keep an eye on them, look after them before the ceremony, and give them a cuddle if they become overwhelmed. 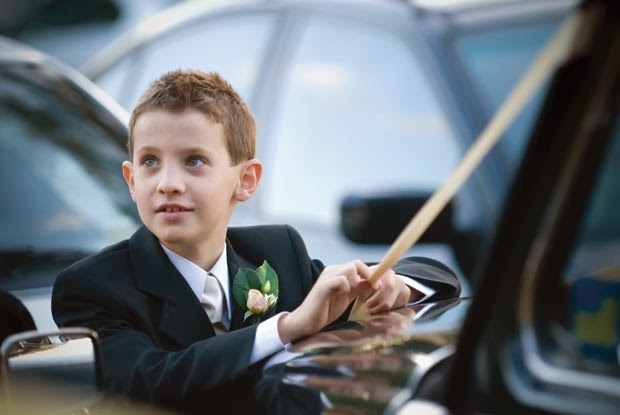 Provide them with a quiet activity to avoid restlessness and boredom while they are waiting for the ceremony to begin. Pack a bag with puzzles, games and colouring books, make sure children are rested and well fed – and don’t forget one last loo break before the procession. Children are unpredictable so prepare a contingency plan if they are part of the procession. If warning signs emerge that tears are imminent, have a member of the wedding party ready to accompany them down the aisle. 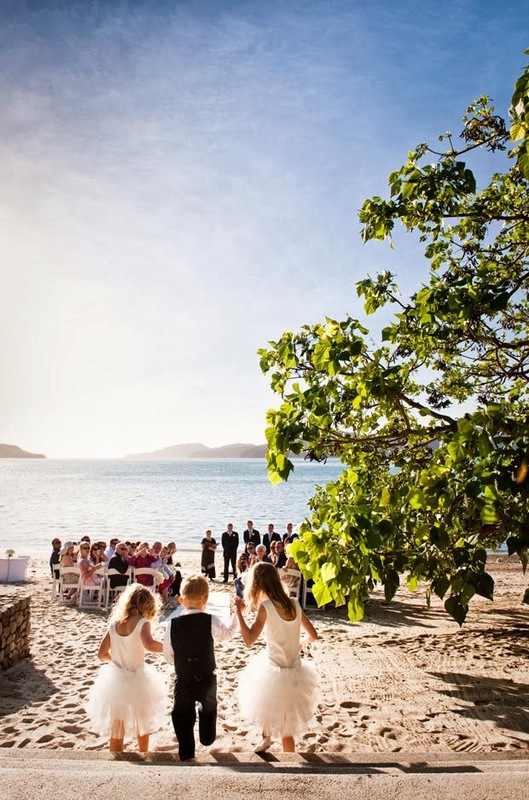 During the ceremony, including the children in the vows is a special way to assure them of their importance and their place in the new family. To signify the blending of two families you can have a special ceremony right after you exchange your vows. A sand ceremony where, along with the new couple, each child pours a small bag of coloured sand into a large glass vase is also a wonderful keepsake. The vase symbolises the new family unit; the assorted colours symbolise the uniqueness of each person, and as the various hues swirl together so the separate individuals combine into one family. 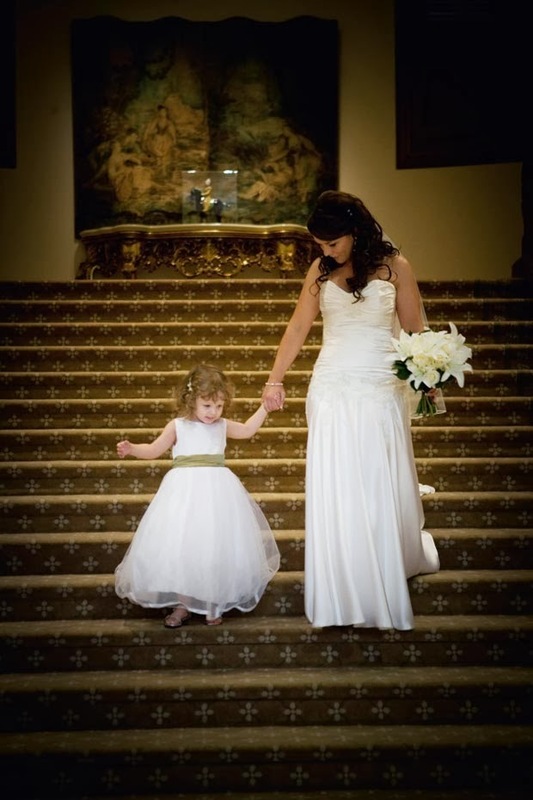 Other ways couples can incorporate their children into their wedding include having the family all stand together as the celebrant offers a blessing, or a unity candle ceremony where all members of the family have an individual candle or taper and together light one ceremonial candle representing the new family. Make sure there are lots of photographs taken of all of you together on the day. Remember you are beginning to create memories and a history for your new family. Once the ceremony is over children will love handing out rice, confetti or bubbles to guests from a basket and of course throwing confetti and blowing bubbles themselves. Remember that children might not do everything they are supposed to do during the ceremony – it won’t be perfect but it will probably be cute and entertaining. Some dream of cocktails by the pool and romantic walks on the beach at sunset while others want to hit the water slides and play with gigantic, inflatable, killer whales. Whilst not everyone’s idea of a romantic getaway, bringing the brood on your honeymoon is a fun and fabulous way to bring together new parents and new siblings and a great opportunity to relax as a family after the wedding. The perfect ‘familymoon’ provides lots of fun family time, as well as supervised activities for the kids, allowing for quality couple time for the newlywed parents. Many great ‘familymoon’ destinations offer kids clubs, childcare and babysitting services to ensure the perfect balance of family fun and romance. Children can be involved at the reception with welcoming guests in the receiving line, presenting wedding favours to guests, handing out cake to guests, handing the guest book around to be signed and taking photographs. If the children are staying on at the reception, ensure you arrange some kid friendly elements. If there are quite a number of children at the reception, consider having a separate room for younger children with suitable food, games, activities, entertainment and supervision. If your budget allows, enlist the help of a babysitter for the evening to keep an eye on them especially during dinner and speeches and later in the evening when they start to get tired. Remember to bring a change of clothes for the wedding reception – this way they can eat, run around, and play with crayons or other toys, all without fear of ruining their good clothes. Provide age appropriate activities to keep the children entertained. Toddlers will be happy playing with toys and colouring, while the primary school age set prefer watching movies and playing video games. Older children shouldn’t be sequestered into another room but rather should feel free to come in and out of the reception and dance and eat cake with the adults. It is advisable though, to organise a relaxing room for older children if they feel exhausted after a long day and just want to watch a movie or hang out. You also might consider offering to invite a friend or two to keep them company. If you are having children seated at the reception ensure you provide them with appropriate food, entertainment and most importantly, supervision. When seating children, while it might seem like a good idea to put all the children at a table alone, an unsupervised group of kids is the fastest way to go from a refined reception to messy madness. Hire a babysitter or assign a responsible teenager to supervise at the kids table. When it comes to food, forgo the foie gras and save the smoked salmon for guests who will appreciate it. Provide kids with pizza, pasta or other casual food they enjoy. A children’s meal will keep them happy and will also save you money. Provide goodie bags at the tables, including some disposable cameras, colouring books, activity books or craft that will help keep them entertained during the speeches. If the wedding is going to run late into the evening, hire a babysitter. Having a babysitting service during your wedding will take the pressure off and will provide a place for the children to play or sleep, while you and your guests enjoy the wedding. Remember that kids are unpredictable, so make sure you have a back-up plan. Don’t be surprised if, for some reason, your adorable flower girl decides not to walk down the aisle or the handsome page boy refuses to hand over the rings at the right time. Ensure the child’s age and personality is suited to their role. Whilst some kids shine in the limelight, for some kids, being the centre of attention can be overwhelming and terrifying. Rehearsing and talking about their duties will help kids feel more confident and more likely to enjoy the part they play. Finally, with so much going on around them, little things matter; a hand to hold, a friendly lap or a wink from mum or dad will go a long way to making kids feel secure, happy and a special part of the day.